Every time we visit Nova Scotia, people in Ontario think we’re going to Halifax. “Have a good time in Halifax!” “Safe drive to Halifax!” But the truth is, we rarely go there. My few visits to the city have been restricted to short day trips and airport stops, and not a whole of time looking around and exploring the sites. A real visit has been long overdue. Thanks to a very friendly brewing company and a lovely mild Wednesday, we finally got our chance and decided to make the drive into town. We wanted great food, a cool brew scene, and fun and free things to do. And we got it! 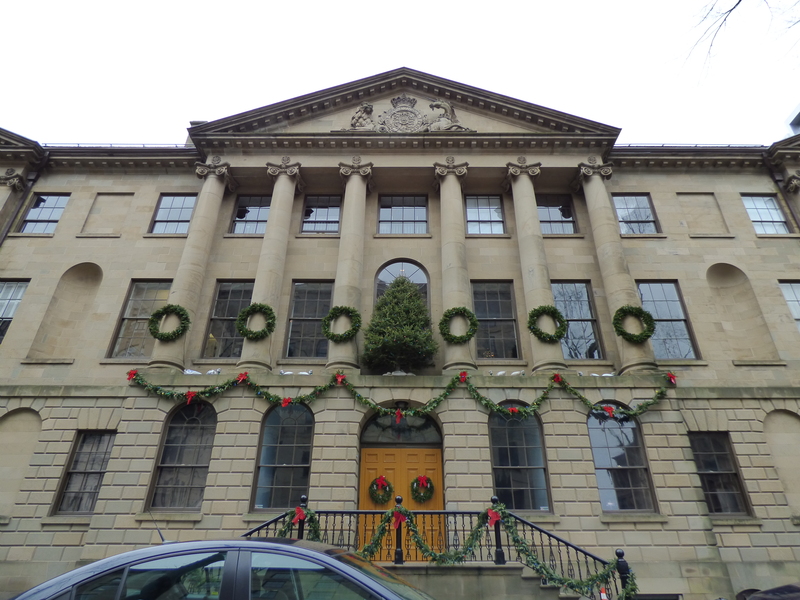 Halifax is the capital of Nova Scotia and the largest municipal area in Atlantic Canada. 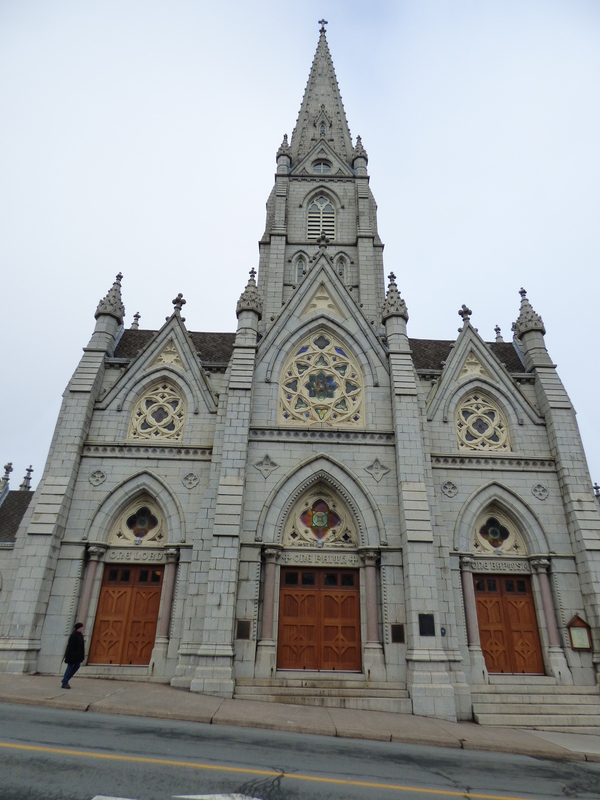 With a population of approximately 415,000 in the regional municipality, it’s a pretty busy place with tons of stuff going on and an exceptional craft beer market. 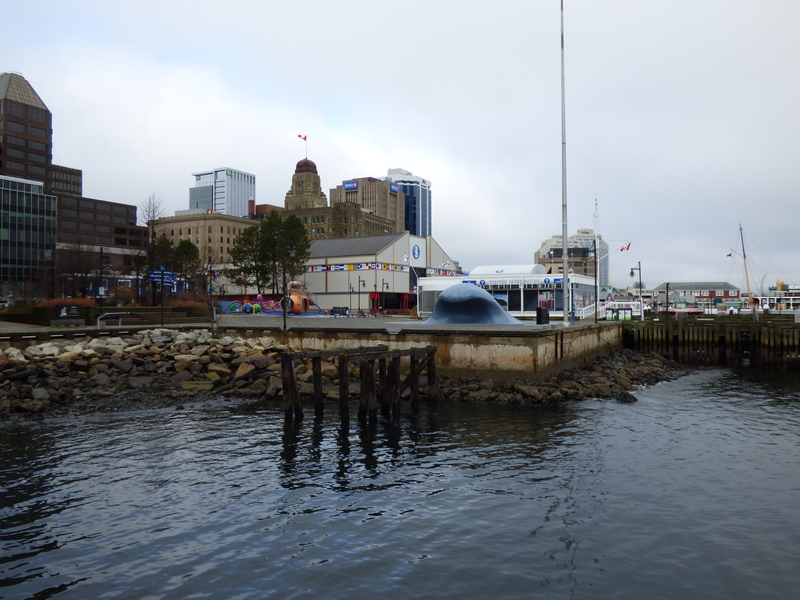 Today we focused our attention on the waterfront and downtown area, embarking on the first of what will surely be a long series of Halifax brewtrips! 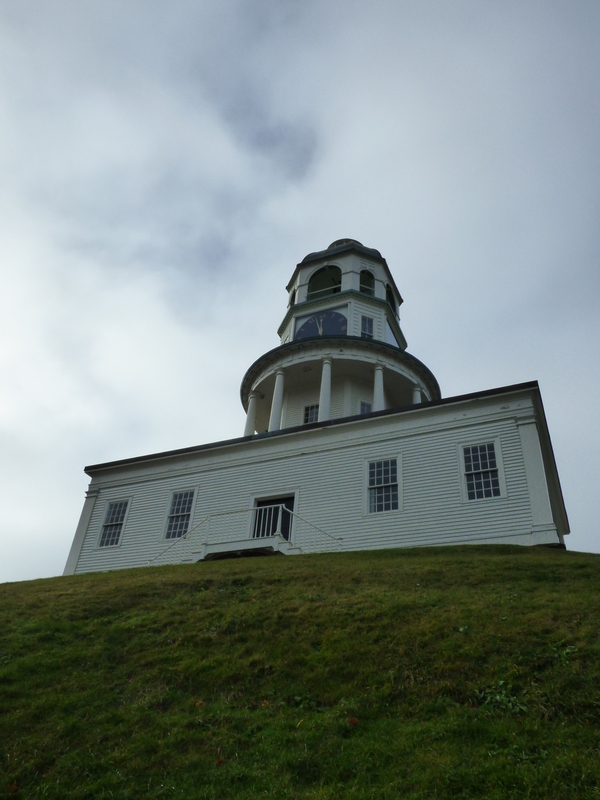 The first thing I noticed about Halifax was how easy it is to get around. Compared to other large cities, traffic on a weekday morning was practically non-existent, to the point that I could stand in the middle of the street taking photos. We could cross the road without the fear of being run over, and cars actually stopped for us at every intersection. Streets were clean, people were friendly, and even panhandlers wished us a Merry Christmas. What a nice place to be! A bit of the harbourfront! See the Big Wave? This is a great city for history nerds. The British settled in (as they do, and not peacefully) around 1749, and since then they’ve had a storied history that’s reflected in the architecture, layout, and overall vibe of the downtown area. We started our visit by walking along the waterfront, which was full of shops and food stands which were unfortunately closed for the winter but I’m sure are awesome in the summer. 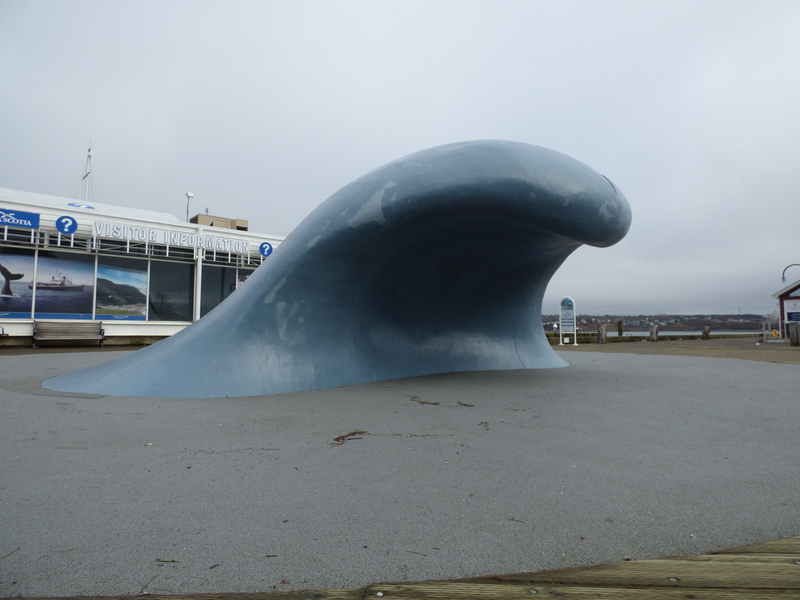 The Big Wave statue was a cool free thing to see and was next to a children’s play structure which I definitely did not climb. From the waterfront we headed uphill (so many hills!) 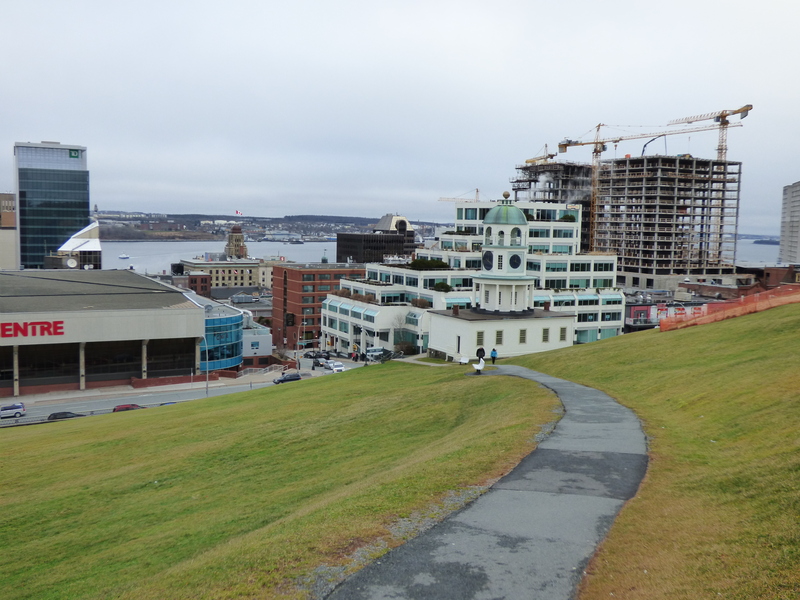 toward the Halifax Town Clock and Citadel Hill. Want to visit a neat place? Check out the Citadel! 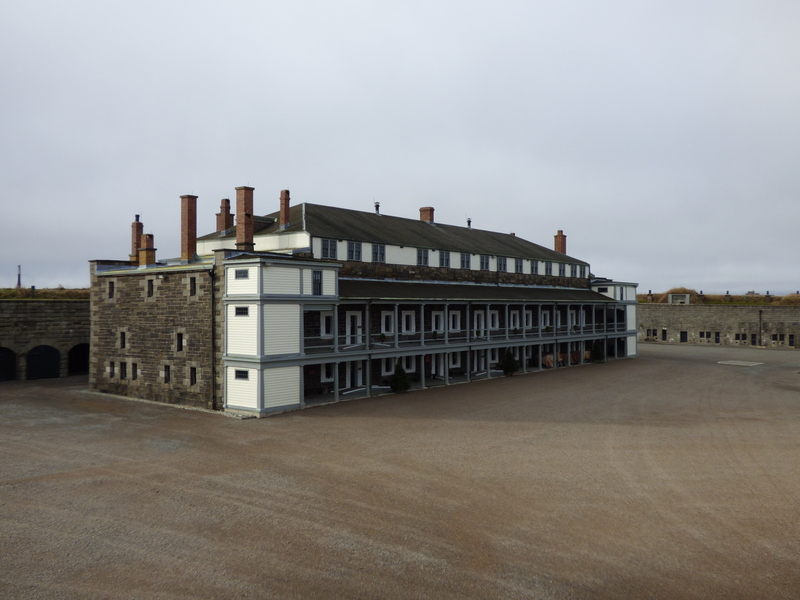 Officially called Fort George, it’s a star-shaped defensive fort that dates back to 1856. We got there right at noon as the daily gun was fired and scared me half to death. Once I got over the heart attack, we headed into the fort, which was partially closed for the season but free of charge as a result – hooray! 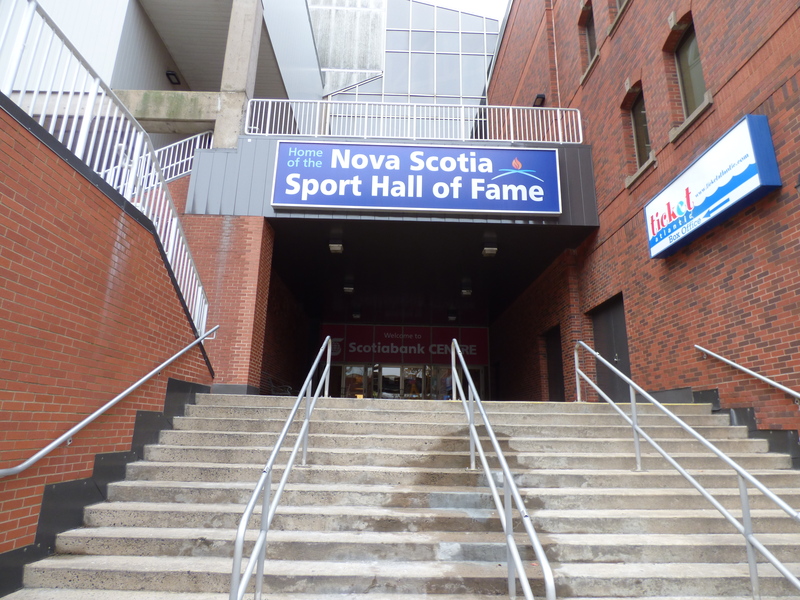 After exploring the fort, we wandered over to yet another awesome and free attraction: The Nova Scotia Sport Hall of Fame. 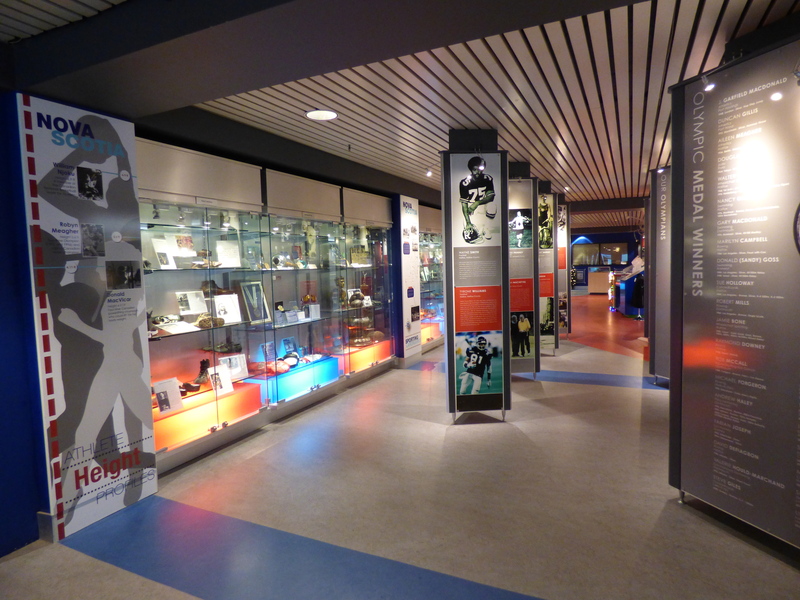 Located in the Scotiabank Centre (which I am told will be forever known as the “Metro Centre”) the Hall of Fame is a collection of sports memorabilia that includes a huge Sydney Crosby exhibit, complete with his family’s puck-marked dryer! 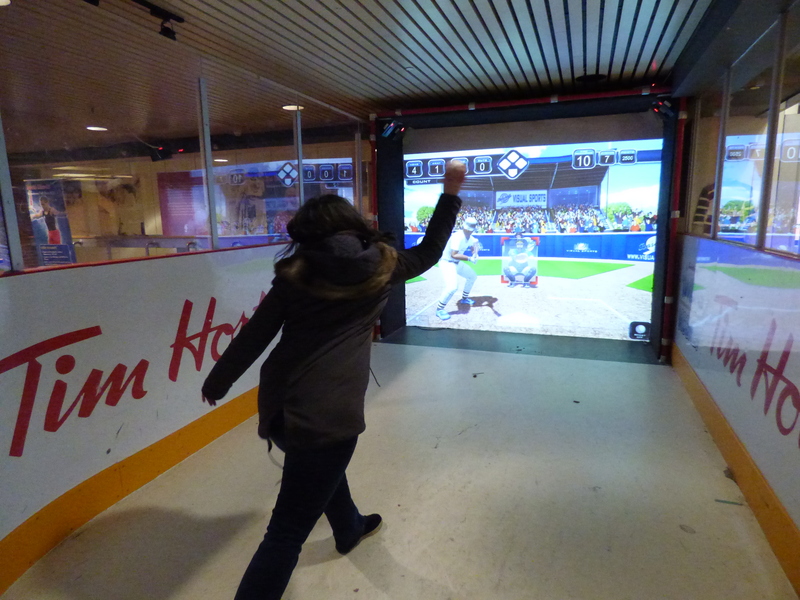 The best part of the NSSHoF is the sport simulator! It’s an arcade-type interactive game that tests your skills at baseball, basketball, soccer, and hockey and is actually really great quality and really fun. It’s normally $1 per game (still good!) but it was free when we were there over the Christmas holidays. We could have spent hours showing off our mad skillz. 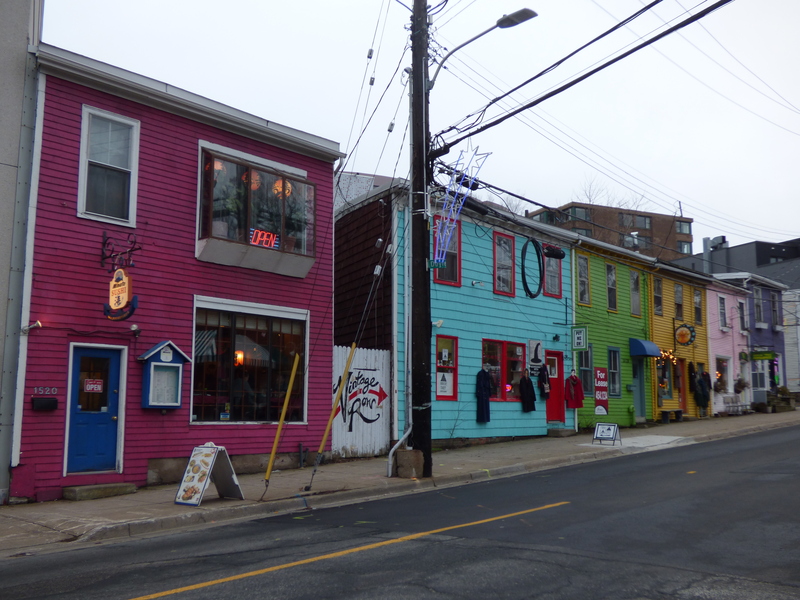 Overall the waterfront/downtown area was a great place to walk around and explore. There was plenty of free stuff to see and do, really neat places to shop, and lots of great photo ops. 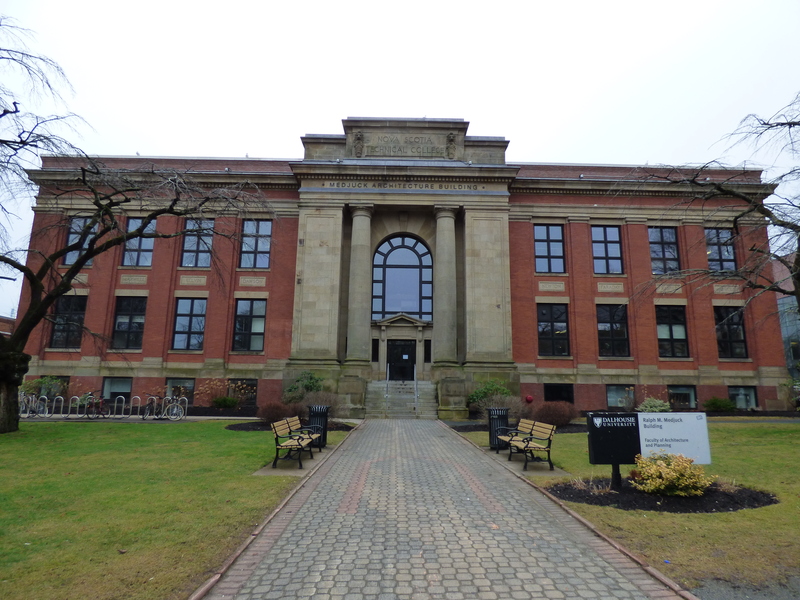 We didn’t have time to visit some of the other major attractions (the Halifax Farmers’ Market and the new Halifax Public Library, for example) but I can’t wait to go back and check them out in the summer! Halifax has a TON of breweries. The city’s well known for non-craft mega-beer Alexander Keith’s, but there are also so many micro-breweries and brew-pubs that it’s difficult to keep track–and there are more on the way! 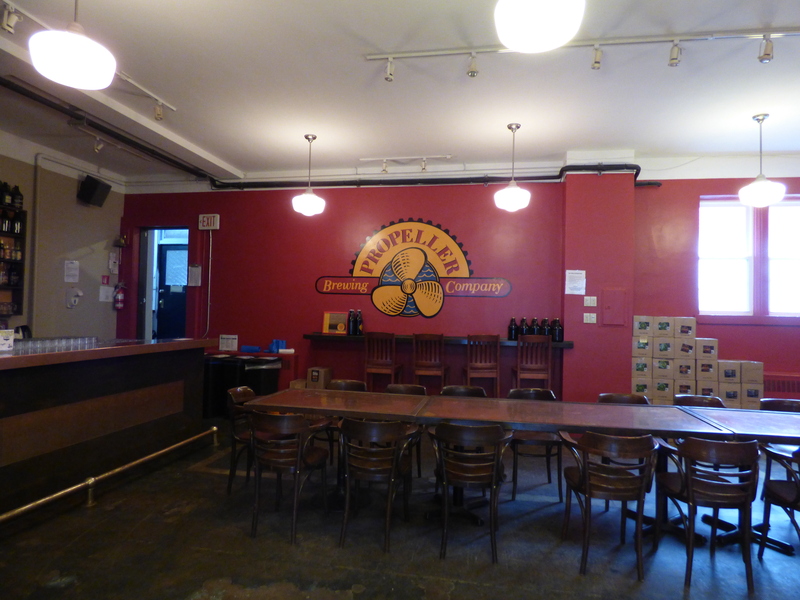 For this brewtrip we focused on two: Propeller and Good Robot. So needless to say, Sean had to have it. He got in touch with the brewery over Twitter, and throughout December Propeller regularly checked in with us to let us know they were saving us a growler. Yes: THEY checked in with US. By the day we went to visit the brewery, they were down to their final two bottles, but ours was set aside with an actual bow on top. How great is that service?? 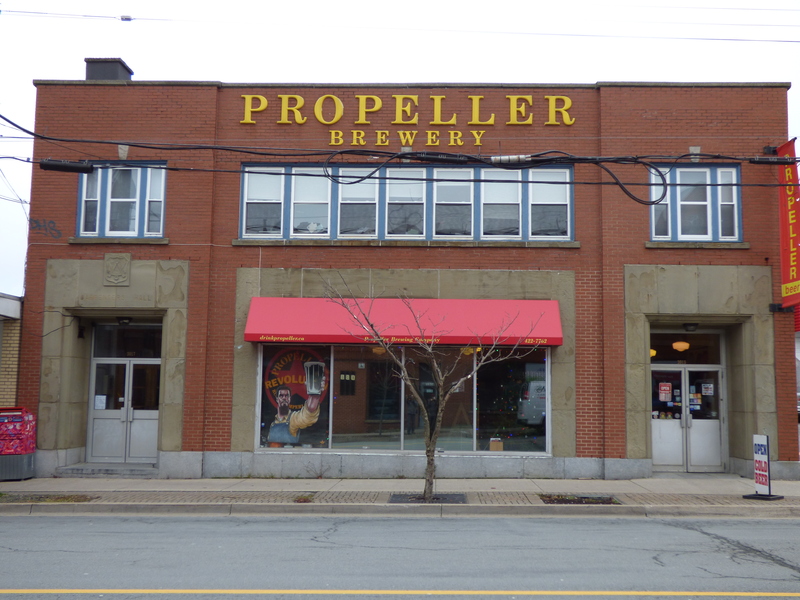 Anyway, we wandered over to Propeller after visiting the Citadel and had no trouble finding it. A brick building with huge signage on both the side and front of the building, plus a flag, plus an actual propeller! The inside was nice and festive, with a Christmas tree set up among the cases of beer and merch for sale and the big open space made it easy to look around. There was also a nice event room which had a “staff only” sign, but I’m a rebel and took a picture. Jaromir Lagr was delicious. It’s a Czech Pilsner (because Jagr is Czech – GET IT??) that was an interesting mix of bitter and sweet, smooth and drinkable without being plain. Citrusy hops and all around great flavour. So glad we got to try it–thanks again, Propeller! After Propeller we were heading to the car to drop off our growler and lo and behold, a familiar face: Our new friend Matthew from Hell Bay Brewing! 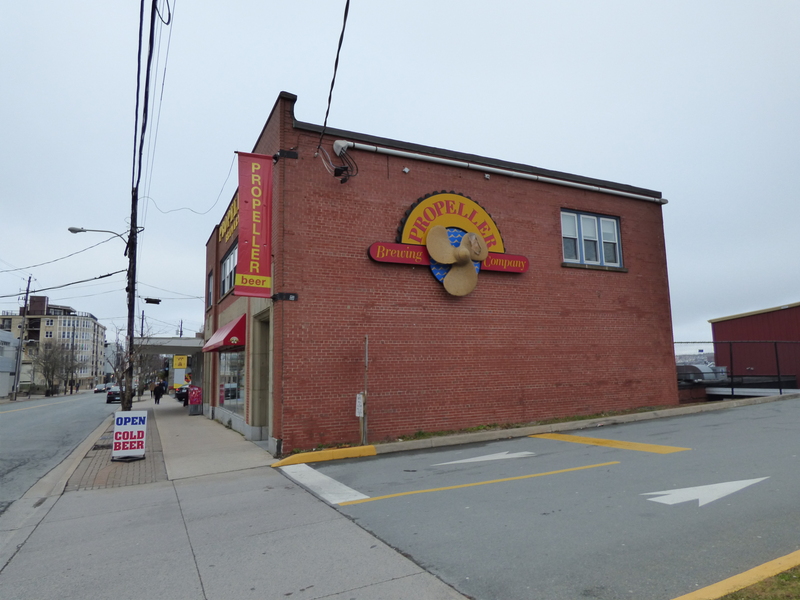 We stopped and had another great conversation about beer and Nova Scotia, and Matthew solidified himself as one of our favourite brewtrip people and Hell Bay as one of our favourite breweries. He was dropping off a keg at the restaurant we were standing in front of: Auction House. “Have you been here?” he asked. We had not! Turns out, Auction House just recently started brewing their own house beers which Matthew said were delicious, and with that recommendation, Auction House became the next stop on our Halifax brewtrip. 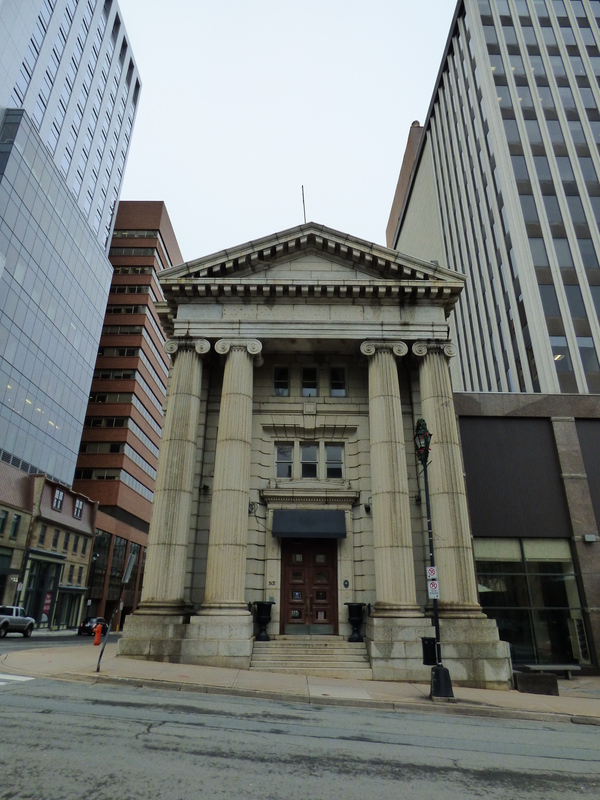 Auction House is in a building that has stood in its spot on Argyle Street since 1765! At one point in its 250-year history the building housed an actual auction house, and today it’s a restaurant which also holds daily auctions that benefit various charities and nonprofits. We were sad to have just missed an auction for a cheesecake, but the meal we had made up for it. We decided to go a little nuts with the food, because we were on vacation and sometimes you gotta treat yo’self. Appies were deep-fried cheese curds with a chili-lime dipping sauce and as fantastic as it sounds. Sean chose the flat-iron steak sandwich which was open-faced on garlic focaccia bread (best he’s ever had, says Sean) and I had the chorizo burger, which was made of tandoori-spiced ground beef and chorizo sausage: Hoo yeah! We both went with the corned beef hash as our side–super unique, super good–and then for dessert we each had a cup of coffee (damn fine, and hot) and I had Bailey’s cheesecake while Sean had the berry crisp, both of which were homemade and awesome. In all, a vacation worthy meal at a fantastic restaurant! 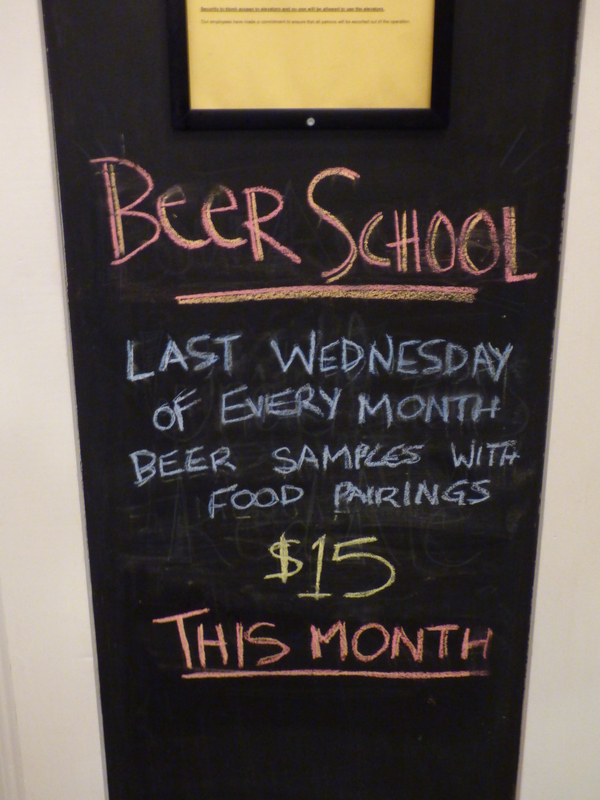 Auction House even has Beer School on the last Wednesday of every month! Only $15! Now let’s talk about their beer. 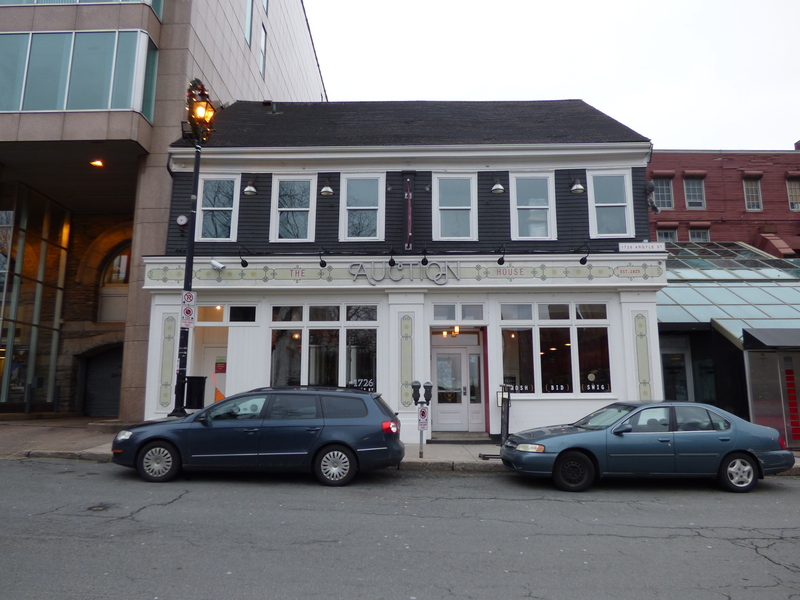 Auction House just started brewing their own beer two months ago and offers seasonal draught choices, along with a solid selection of Nova Scotia craft beer (as well as some big name). Part of the brewing process happens off-site, but the second half is done in the restaurant, in big shiny vats you can see from the front windows. Sean had their amber ale and said it was spectacular (just a little sweet with a bitter finish) and I had something really weird, which was a dunkel made with chai tea. Chai tea. I’m not usually a chai person, but this was a lightly spiced and flavourful beer unlike anything I’ve had before. The cinnamon and cloves were perfect for the season! We’re so glad we came to this place, and if it weren’t for Matthew, and therefore Hell Bay, and therefore brewtripping, we never would have known about it! Finally it was time for our last brewery of the day. Good Robot had also given great customer service via Twitter after Sean had noticed they were brewing a cool new beer named “David Lynch Damn Fine Coffee”. Fans of Twin Peaks that we are, we couldn’t resist, so Sean asked whether it would be ready when we were here. Long story short, unfortunately not, but we went there anyway. The brewery was located outside the downtown, a bit more toward the north end of the city. The exterior was one of the coolest we’ve seen, with a fake “lawn” on the driveway and yellow computery circuitry painted on the outside walls. The inside was small, but we could see everything that was going on and all the cool merch they had for sale, as well as lamps made of old growlers! The Good Robot logo was painted on their big silver vat and was a nice bit of branding that I thought was cute. 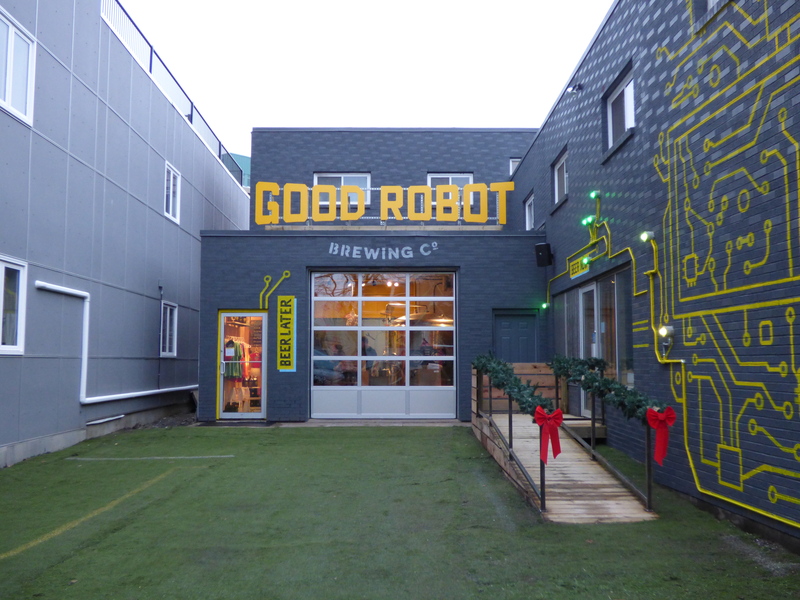 I think our favourite thing about Good Robot (besides their really tasty beer–a delicious American pale ale called “Burban Legend”) was the size of their growlers! Along with the standard 1.89L growler, Good Robot offers a smaller size of 0.95L, a perfect amount for one person or a small group. Usually we rush through growlers because there’s only a small window of time in which the beer can be enjoyed, but the smaller size seemed perfect and I wish more breweries offered it. We’ll be back to Good Robot again soon, hopefully for some of the David Lynch Damn Fine Coffee (and maybe some cherry pie). So that was our first Halifax brewtrip. Looking back, I’m glad we visited only a small part of town because this post is long enough as it is! 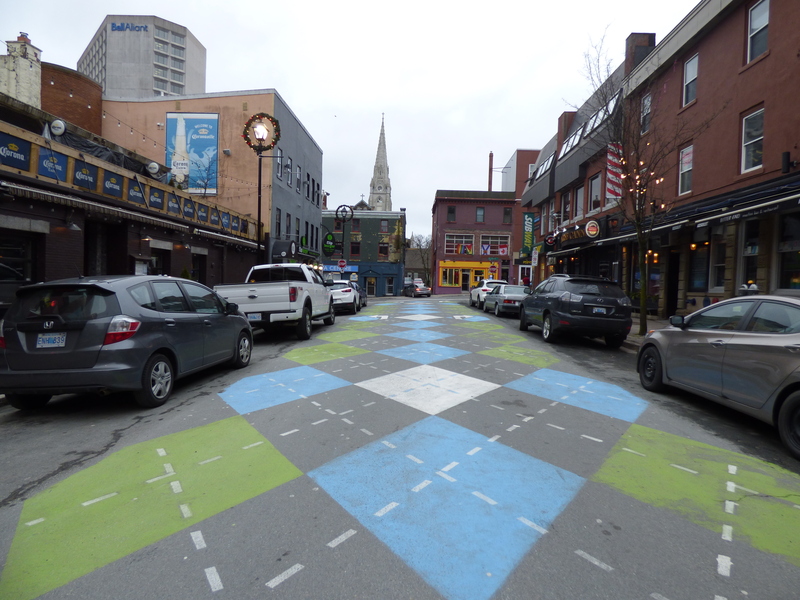 Halifax is a super cool city with nice people, neat sites, and a heck of a lot to do. 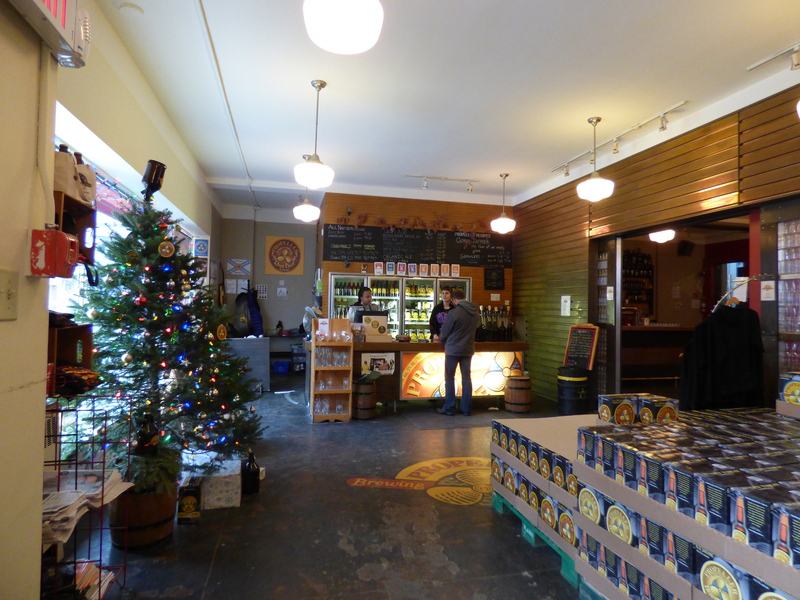 There are many breweries left to visit, but we’ll save those for our next trip! 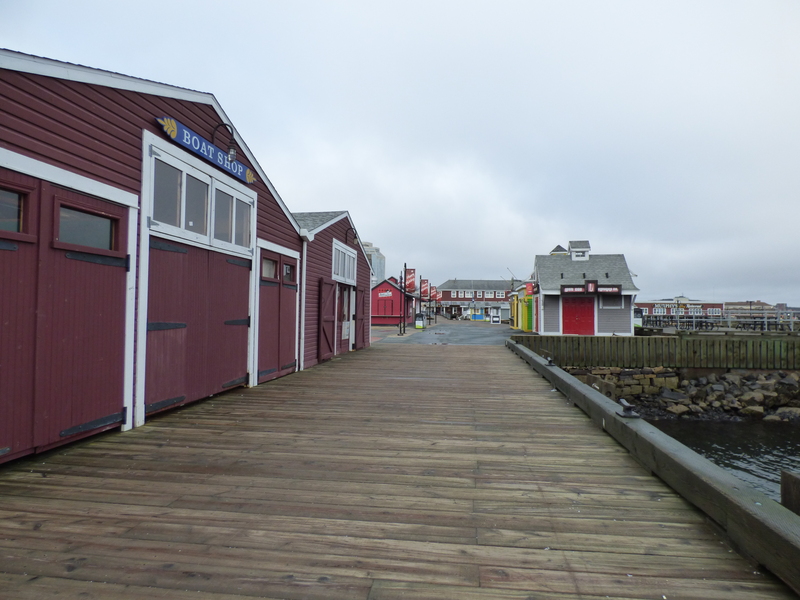 The boardwalk – all boarded up for winter! 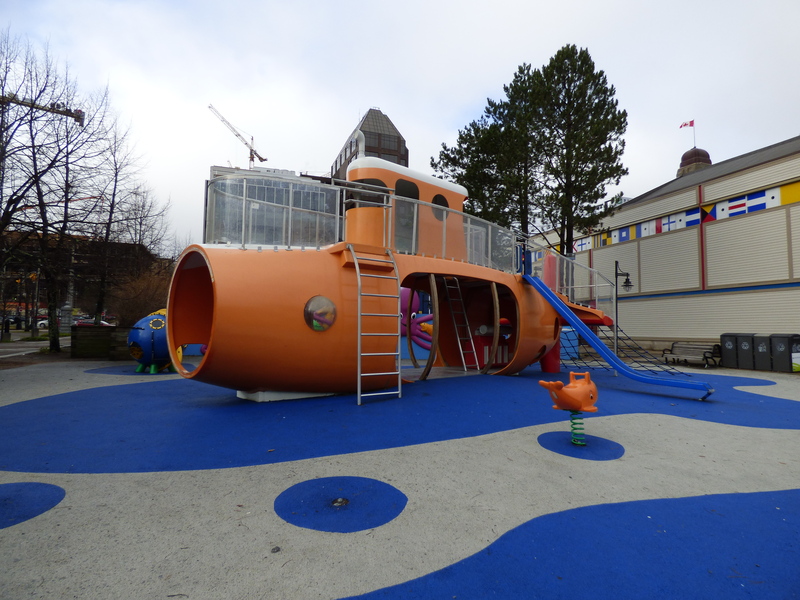 A fun submarine play structure for children. Not adults. Looking up at the Town Clock. The view of Halifax from the Citadel. 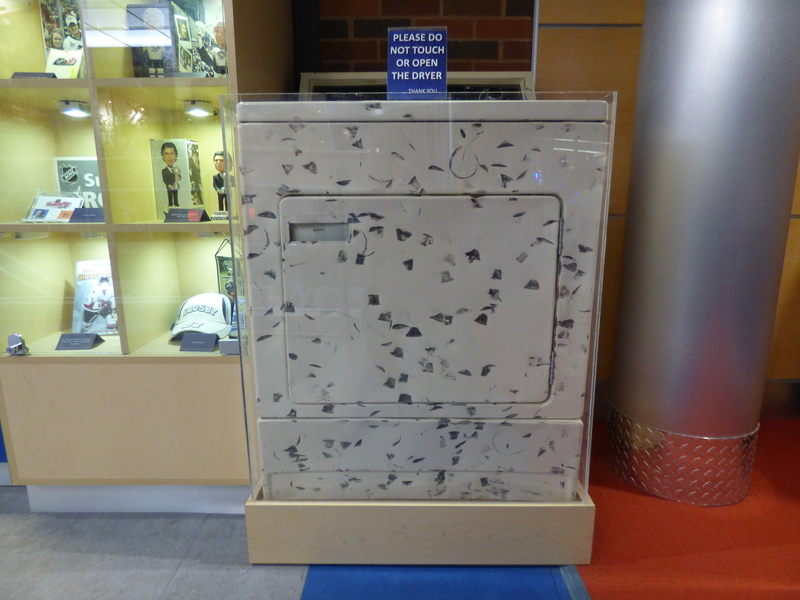 The famed Crosby family dryer. 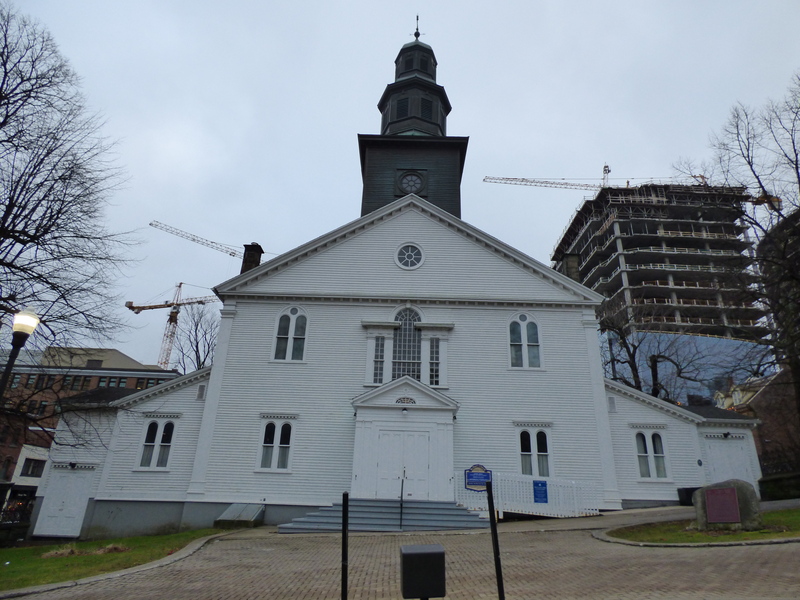 St. Paul’s church, the oldest building in Halifax and oldest surviving Protestant church in Canada! Opened in 1750. Inside Propeller – a great space! The “staff only” event room. Shh, don’t tell! 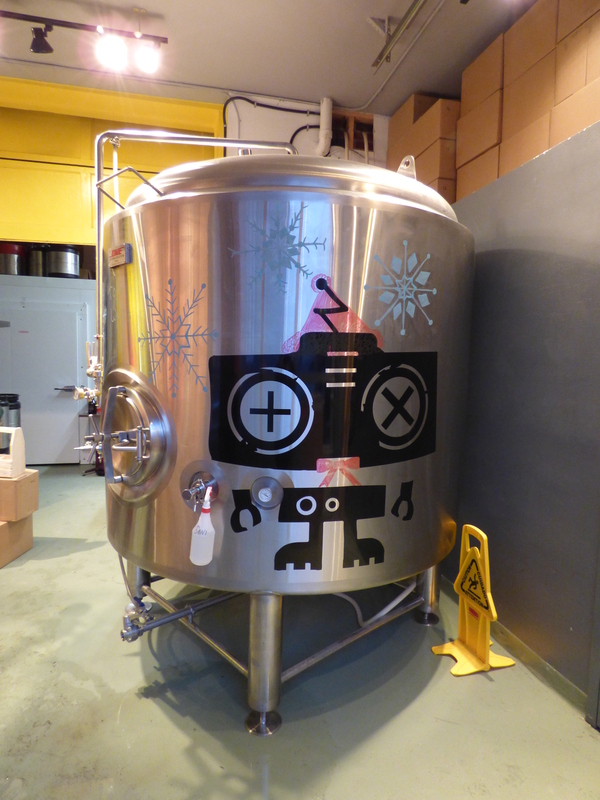 Beer vat at Good Robot – so cute!